Contiguous Piled Retaining Wall, excavated and propped. 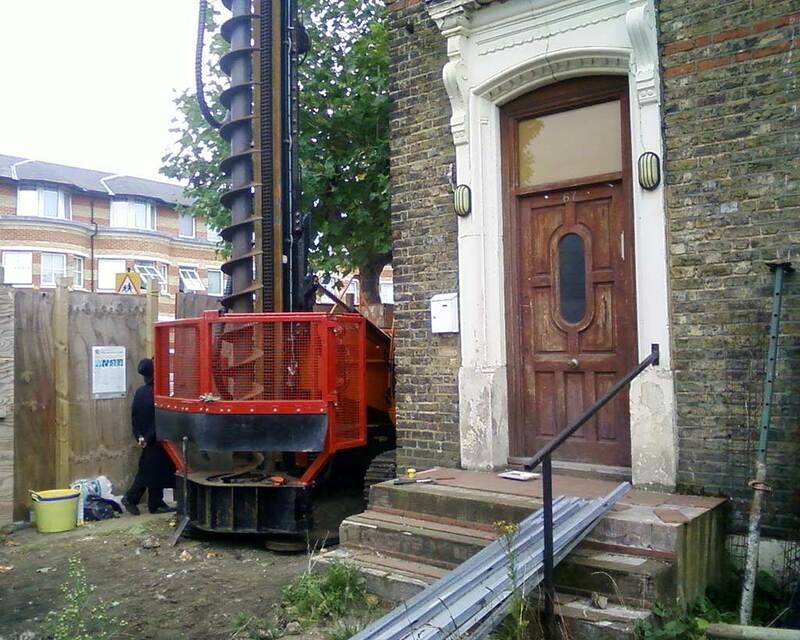 Bored pile retaining walls have many uses, basement construction, cut and cover bridges, bank stabilisation and road/rail cuttings, but the system which you may need will depend heavily on certain factors; Ground conditions, Retained height, Ground water and Deflection, etc. Rotary Bored Contiguous Piled Walls. 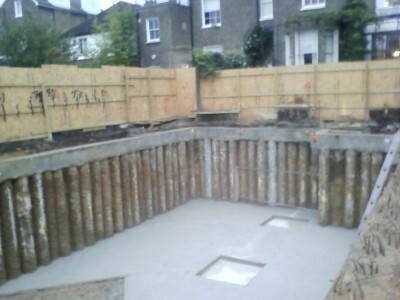 CFA Contiguous Piled Retaining wall; Barnes, London. Steel Cased Bottom Driven piled retaining wall, for a cut and cover bridge; Devon. 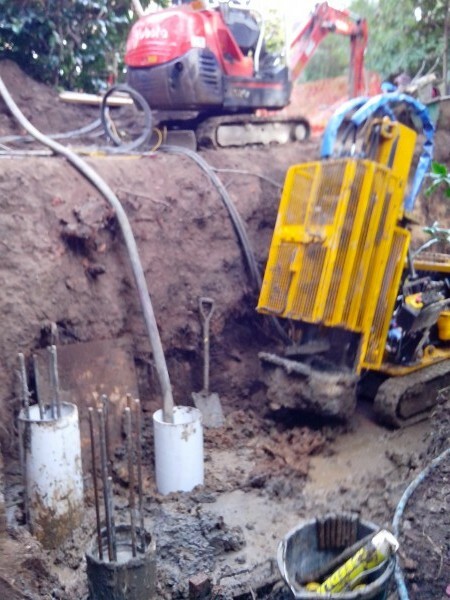 Rotary bored Cast-insitu contiguous piled wall; Hampstead heath, London. Large diameter and mini piled cast-insitu retaining walls, give an economic and efficient way of constructing, permanent or temporary piled retaining walls. These walls are ideally suited for deep basement construction in the ever expanding basement industry in London, as they can be bored and cast in restricted access and open site conditions, and where adjacent structures require support. Which is perfect for domestic projects as the piled retaining wall, can be bored and cast parallel to the party wall, retaining back neighbouring properties, giving the client maximum under ground space. 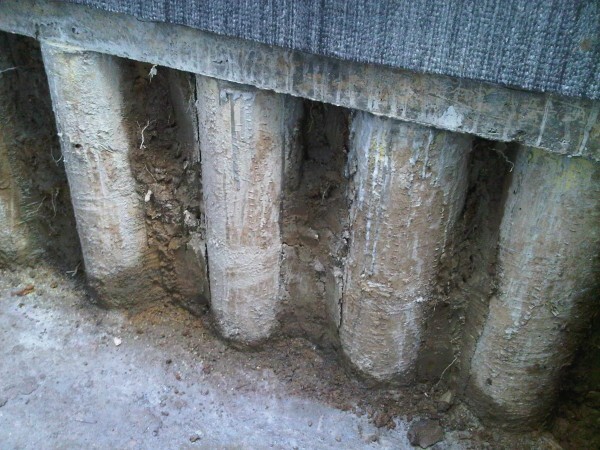 Contiguous piled walls are suitable, where the ground water level is below the depth of excavation. 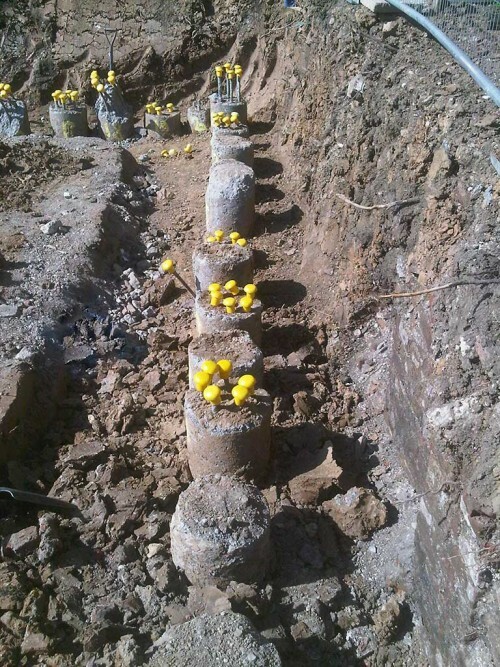 It is the most economic and fastest method for piled retaining walls and the piles can be cast at 150mm greater than the diameter of the pile be used, which will leave gaps of soil once the excavation is complete, but will then have a reinforced concrete lining applied to prevent long term water ingress. 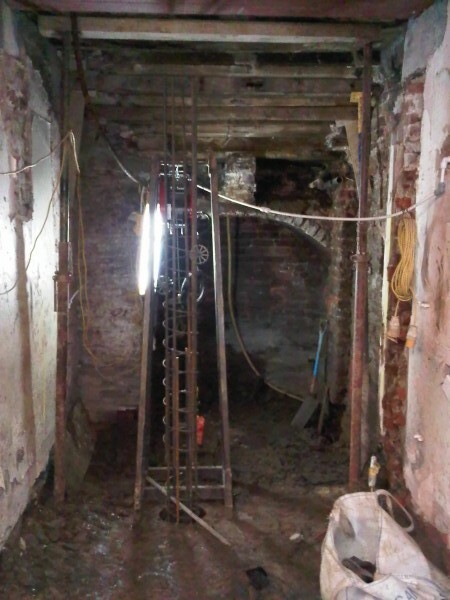 Capping beam cast and basement excavated; Nottinghill, London. Hard/Soft secant piled walls are the most cost effective way of casting a piled wall, where short term water retention is needed. The wall consists of two types of interlocking pile so no gaps are left; the primary pile, (Soft) is constructed using a concrete, bentonite mix which is bored to the same toe depth but has no reinforcement. The secondary pile, (Hard) is bored and cast to the same toe depth but with structural concrete and reinforcement. 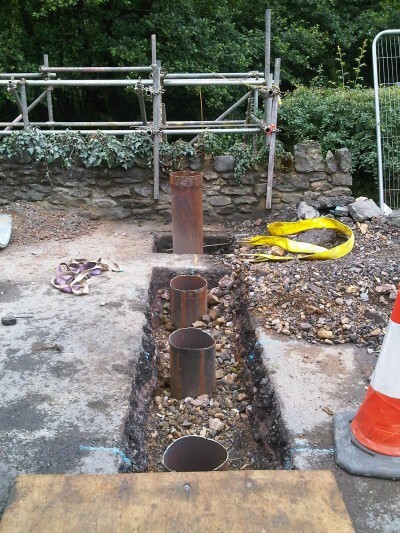 The primary and secondary piles interlock 150mm into each other, and are used in applications where ground water is held back temporarily, but may need a reinforced concrete lining depending on requirements. Hard/Hard secant piled walls are similar to Hard/Soft, but both primary and secondary piles are cast using reinforced structural concrete, and require heavy duty rotary rigs to cut through the primary pile to cast the secondary pile, specialised cutting heads are also required. The finished wall will provide a water tight and fully concreted finished face. 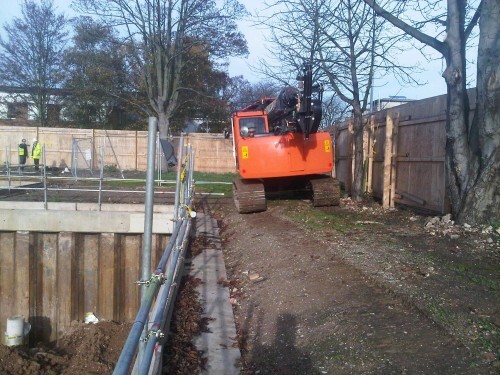 King Post Walls are a cost effective system of retaining walls. 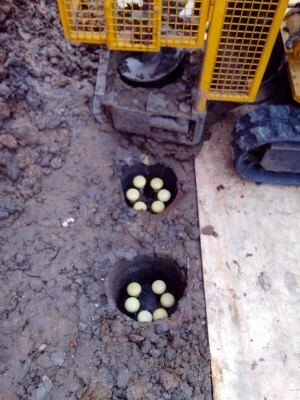 The simple and quick installation comprises of boring a hole, filling it with concrete and installing an H pile which facilitates timber sleepers or concrete/steel panels to be mounted between the webs of the piles, resulting in the finished embedded retaining wall. Unconcreted King Post; Holland Park, London. 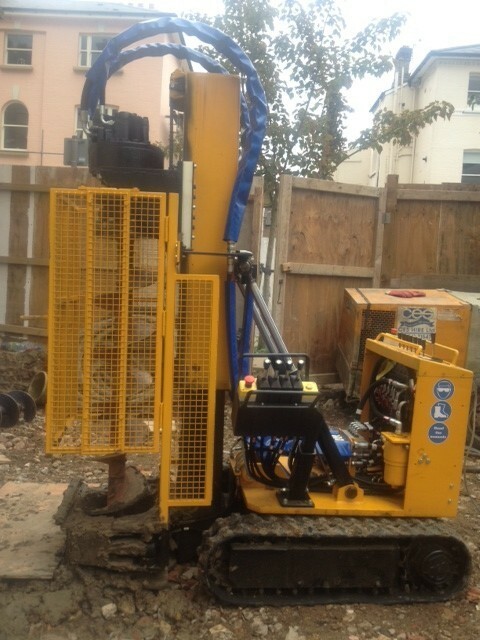 At Advanced Mini Piling Systems we specialise in restricted access retaining walls, with our engineers, experienced foreman and specialised rigs, we offer an economic and efficient service. A lot of time and money has been invested in specialist equipment, and some times new equipment is developed for a certain project, to get around an unforeseen problem safely and economically. The Kitten rig is one of the best mini rigs around, with a minimum working width of 0.7m and working height of 2.9m. 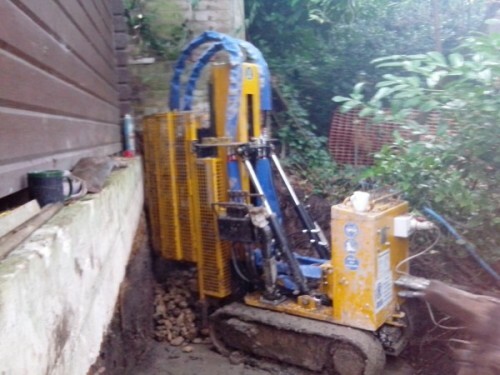 The Kitten is capable of Rotary bored depths of 20m and can be used with temporary liners and hollow stem flights, and with a safety cage installed. 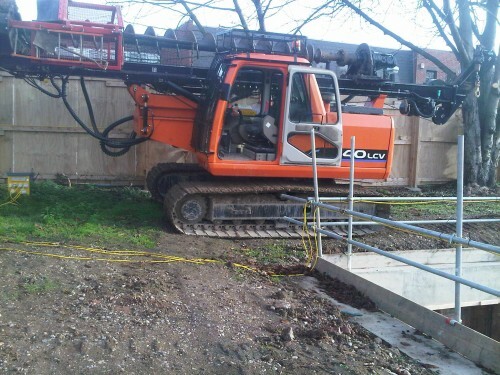 Kitten rig retaining wall; Wimbledon,London. Hollow stem piled retaining wall. Lifting frame developed for deep basement construction where heavy reinforcement is used. Piled retaining wall cast internally with low head room. This rig was developed by our company especially for installing piled retaining walls, the rig is 2.7m wide and has a 10m mast. It can be be used with a kelly bar and solid stem augers from 300mm dia to 500mm dia to over 30m deep. 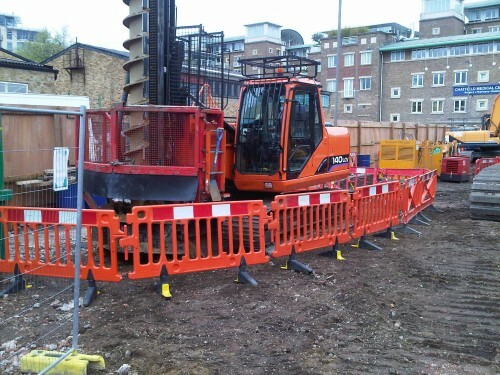 With a winch SWL of 1 ton cages can be safely lowered with out need of a crane on site, this rig can also be set up in minutes allowing us to start piling on the same day without a costly set up day. 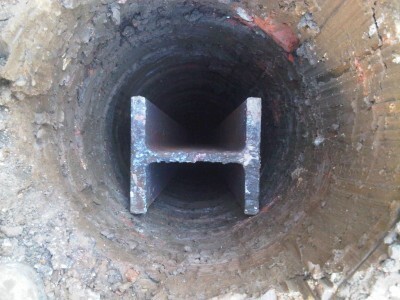 350mm contiguous piled wall; Swiss cottage, London. 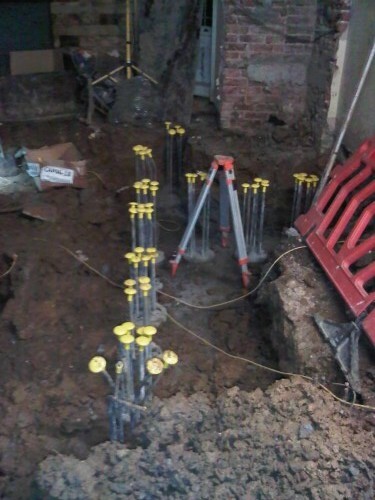 Contiguous piled wall for basement, North London. Kelly bar attachment, rig easily manoeuvrable. 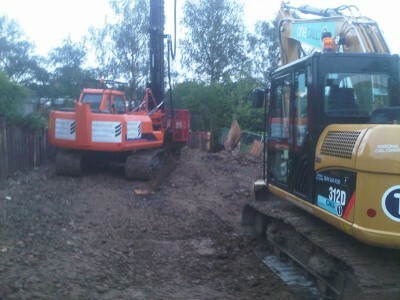 Large diameter piles in restricted access conditions. 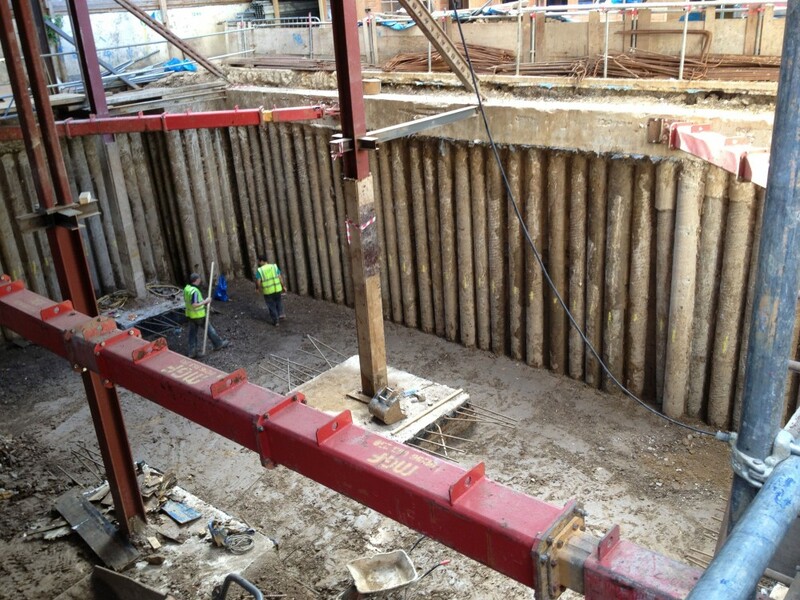 Pre bore in ballast to allow sheet piles to be easily driven; Battersea, London.